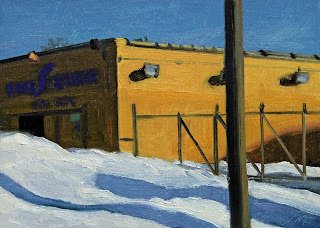 Today's daily painting is of warm sunlight on a neglected building on Michigan Ave.
Today's daily painting is of some deep blue shadows dancing across the fresh snow. 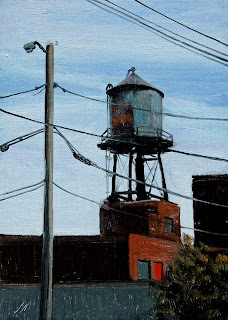 Today's daily painting is a view of the old Detroit Edison Power Plant. 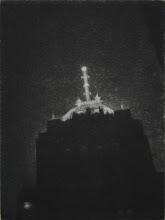 It is no longer standing. 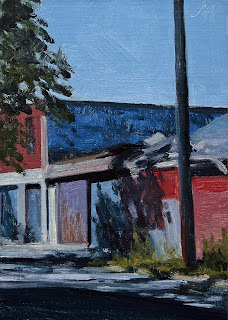 Today's daily painting is a view of sun light on a small building in Hamtramck. 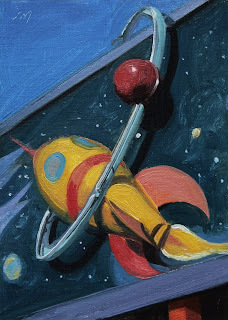 I really liked the simplicity of this composition and color scheme. Sometimes less is more. 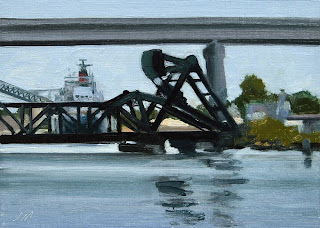 View of a freighter and bridges on the Rouge River in Detroit. 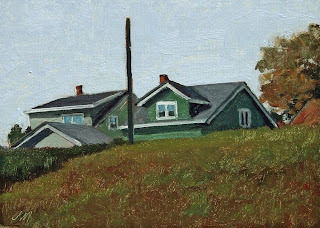 We are so tired of looking at snow, I decided to paint a little green. You get an interesting perspective looking up at the houses from the freeway. Many have been torn down but these two still remain. 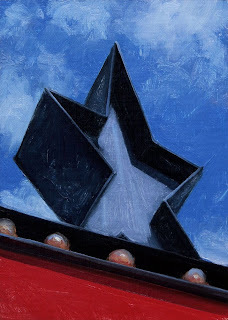 oil on linen/panel, 7"x 5"
All I can say is the World celebrates along with us at this historic moment. 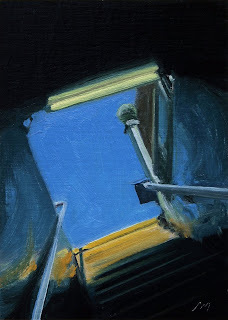 This daily painting is a view from the darkness of a subway entrance, looking into the light of a crisp blue sky. 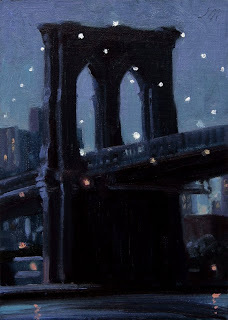 This daily painting is a nocturne of the Brooklyn Bridge. 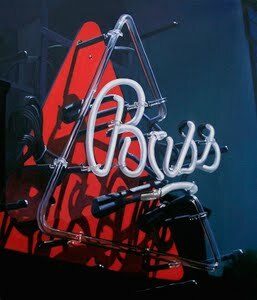 I guess all the talk of Hedge Funds has me in a New York state of mind. 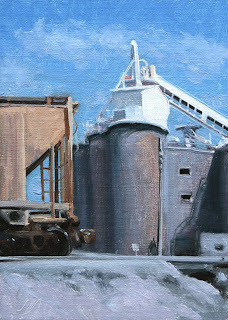 Tomorrow's painting will be of NY also. 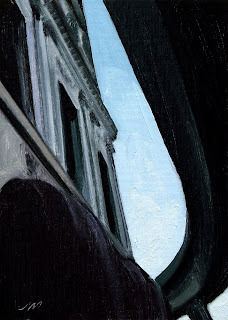 A view coming out of the darkness of the subway into the light. 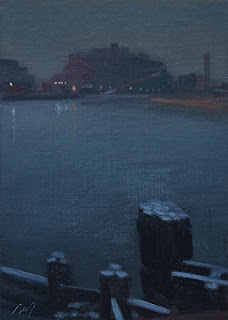 This daily painting is a nocturne from Belle Isle looking north. 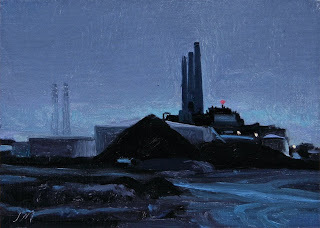 I will be doing a few more nocturnes maybe with a little more light and color. 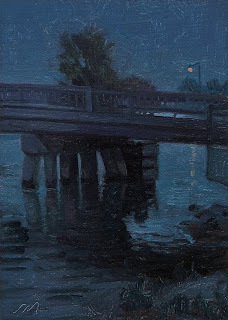 This daily painting is a nocturne of small bridge on the North end of Belle Isle, I am going to do a few more nocturnes as I am really enjoying the close harmony of the limited color palette. 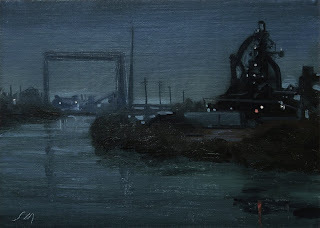 This daily painting is a nocturne of the River Rouge with the Rough Steel in the bkg. 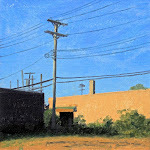 This daily painting is of shadows creating interesting shapes and color on a set of alley doorways. 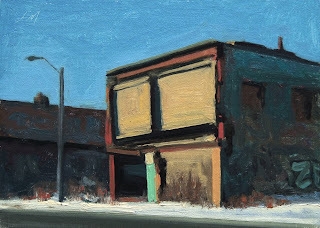 This daily painting is of a snow covered abandoned house in Brush Park. 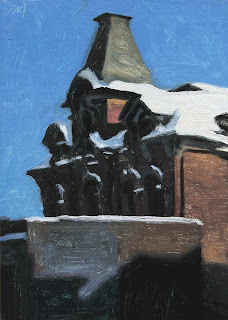 The snow gives the structure a quiet dignity. 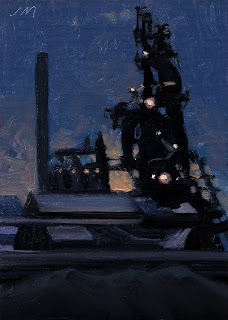 This daily painting is of the limeplant in Woodville, Ohio where my Grandfather worked in the 1940's & 50's. It is still a working plant. 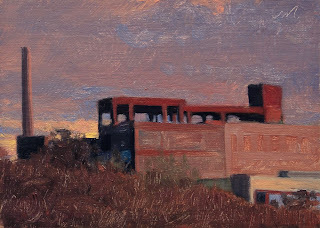 oil on canvas panel, 7"x5"
This daily painting is of an abandoned factory with dramatic late evening light giving everything a beautiful warm glow. 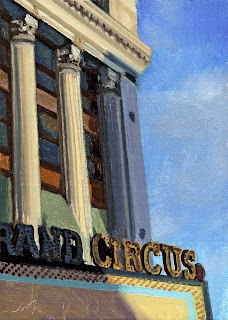 This daily painting is of the Grand Circus Theater in downtown Detroit, it is no longer standing. 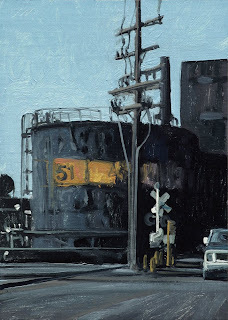 This daily painting is of a storage tank and industrial scene along the road to Zug Island. We were asked to leave the area after taking this shot. 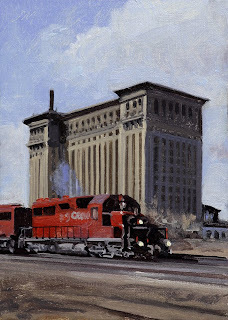 This daily painting is of the interior of the abandoned Michigan Central train Depot. 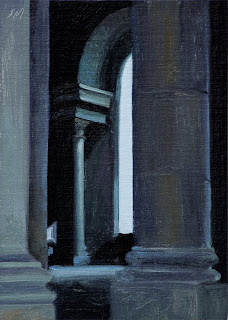 Showing a soft light on the stark detail of the arched window and column. 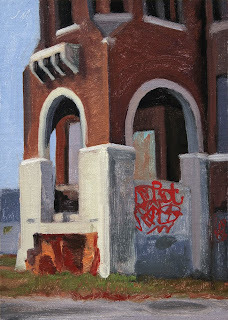 This daily painting is another view of Brush Park. 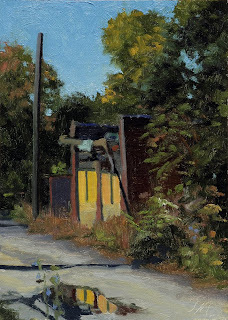 An alley with reflections of yellow doors and corn-flowers. 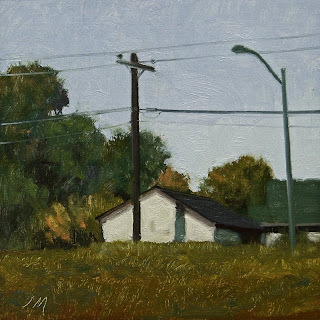 There is such a stillness in this area, you would never believe you were in a large city. 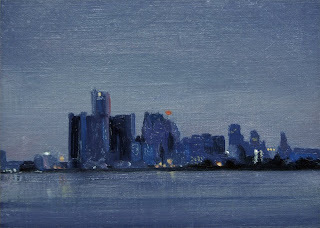 This daily painting is a Detroit Skyline nocturne. 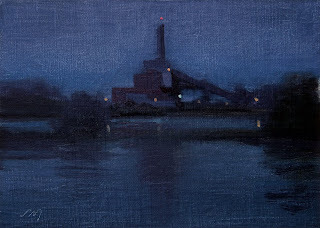 The view was taken from a river boat on the Detroit River. 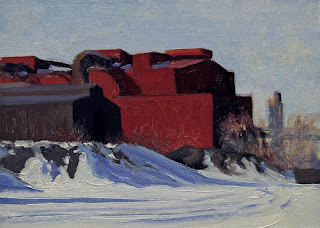 This daily painting is of the River Rouge Industrial complex on a snowy, sunlit day.